So in the spirit of adventure, I bought myself a new baby seat for my bike for my upcoming birthday. Your lovely Aunt C lugged it all the way back from New York with her.. Yes, it is a bit of a present for you too, as you’re obviously the one who will sit in it for the moment, but really it’s so I can have some bike freedom back! And your neck is now strong enough for safe riding as it will hold a helmet well without strain. It’s a Wee Rider .. Which I spent a lot of time choosing but really who knows until you try it, right? So more on how it goes later. Because before I can get you into the seat and we can pedal off into the horizon to explore the world to our heart’s content, we need to get it onto the bike and feel safe. Step One: Open the box. Check. We did that a few weeks ago. It has been sitting in the kitchen ever since. In fact, when I went to look at it again yesterday I found a toy stash in there: you’ve been using it as a toy repository or toy box! Step Three: Attempt to clean bike and make serviceable. Ok. I admit, I failed on step 3. Got the bike cleaned. Even managed to find the bike pump and pump up the tires, and the lube and lubricate the gears. But failed on actually getting the gears to work smoothly and the brakes to be safe enough for me to put my body weight behind them on a hill and expect to stop. Let alone attempting to do so with you firmly planted and I imagine quite distractingly waving your hands around in glee as we careen down a hill [again, I’m assuming that you’re going to love this. If you don’t I think you’re going to have to learn to]. Obviously I just needed some help! 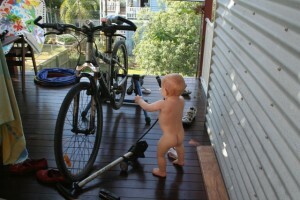 Learning to do bike maintenance - we start them early in our house! Obviously I just needed some MORE help! So. Soon to come: the bike will be revamped, baby-seat attached and we may attempt to cycle somewhere!! !